It was just a drill, but a drill that emphasizes something all too real on college campuses in this country. Westminster College’s simulation of a shooting on the Fulton Campus is believed to be the first campus-wide shooting drill in Missouri. Statistics almost too horrible to comprehend, the 32 dead at Virginia Tech and five at Northern Illinois, spurred Westminster to conduct the drill. In it, a trained law enforcement officer imitated an armed man who burst into a classroom. He shot and wounded five students. Westminster used a campus siren, e-mail, telephones in each building and text messaging to get the word out to students, faculty and staff. Fulton police and firefighters responded to assist campus security. 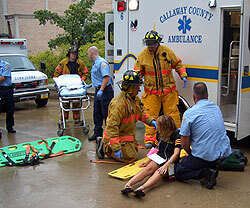 The Callaway County ambulance loaded fake victims and took them for treatment. Students who participated say they can’t foresee such a tragedy happening on the tight-knit Fulton campus, but that it is good to go through such exercises, nonetheless. Authorities say they will evaluate response and determine if changes need to be made.